Patrons of Weidner Center for the Performing Arts have come to enjoy drama in many forms—even politics. 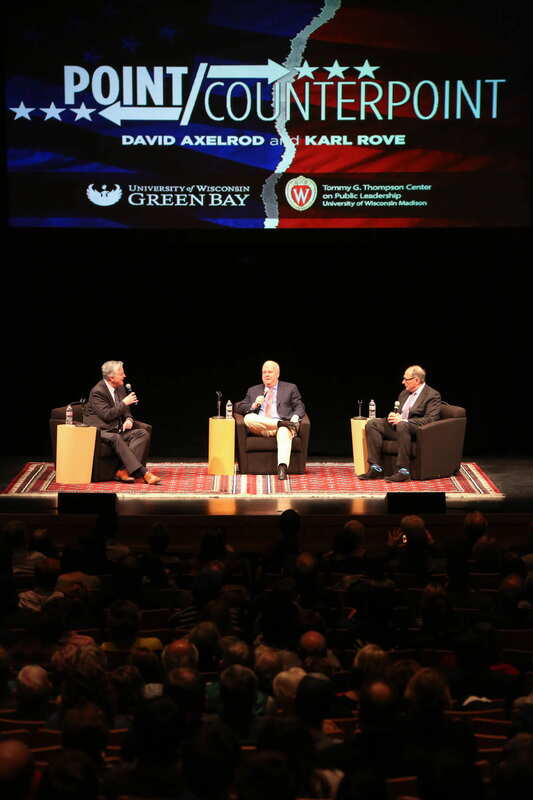 And that expectation charged the atmosphere Wednesday evening when David Axelrod and Karl Rove took the main stage with moderator Michael Gousha, award-winning journalist and distinguished fellow in Law and Public Policy (Marquette University Law School). 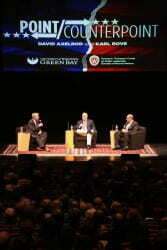 From left to right, Gousha, Axelrod and Rove on the Weidner stage. As expected, politics took center stage. “Every day is election day” as Rove put it. And with the 2020 presidential campaign already in full swing, Wisconsin is sure to remain in the cross-hairs through to an election day that’s still 580 days away. The line gets a laugh from the rapt audience of students, parents, local politicians and cable news junkies. Who knew Karl Rove was funny? Or that these two master strategists from opposite ends of the political spectrum genuinely like each other? Again, Rove gets right to the point. Rove talked of a desk in his home, built by his own Norwegian grandfather, who came to America so poor he spent his first year living in a relative’s barn near Devil’s Lake. “It reminds me of where I came from.” These were real stories, not sound bites. Two people talking about their family’s past and a shared hope for America’s future—something they could both agree on. 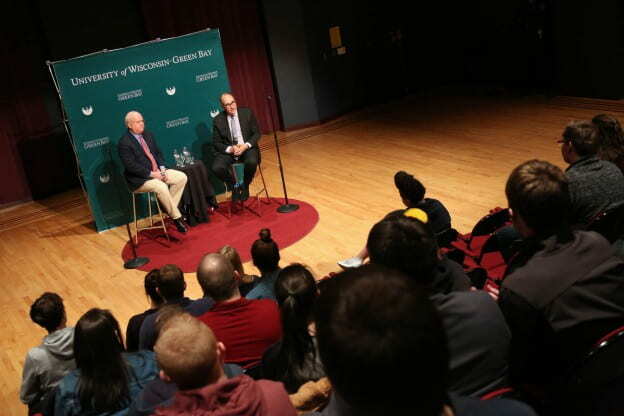 In the top photo above, Axelrod and Rove spend time in a passionate Q & A with UW-Green Bay students prior to the evening event. Photos by M/UC photographer/videographer Dan Moore. Story by M/UC writer Michael Shaw.